I'm Irish through marriage and some of that "Irish Luck" rubbed off on me the other day. I was shopping for a little hostess gift for Wanda, my Mother In Law, for the annual St. Patrick's Day dinner that she likes to host. She loves collecting tea pots and she was born in Shamrock, Texas so imagine how my eyes lit up when I saw this pretty little vintage teapot for only $10.00! 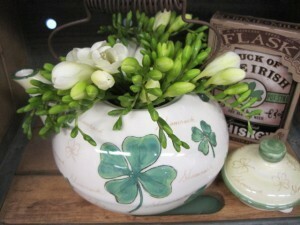 The shamrocks are great but the word Shamrock printed all over is what makes it even more special. I've filled the teapot with some sweet smelling flowers and can't wait to give it to Wanda. I know she'll be so happy with it! Don't you love it when a gift purchase ends up being just as much a gift to the giver as it is to the recipient?